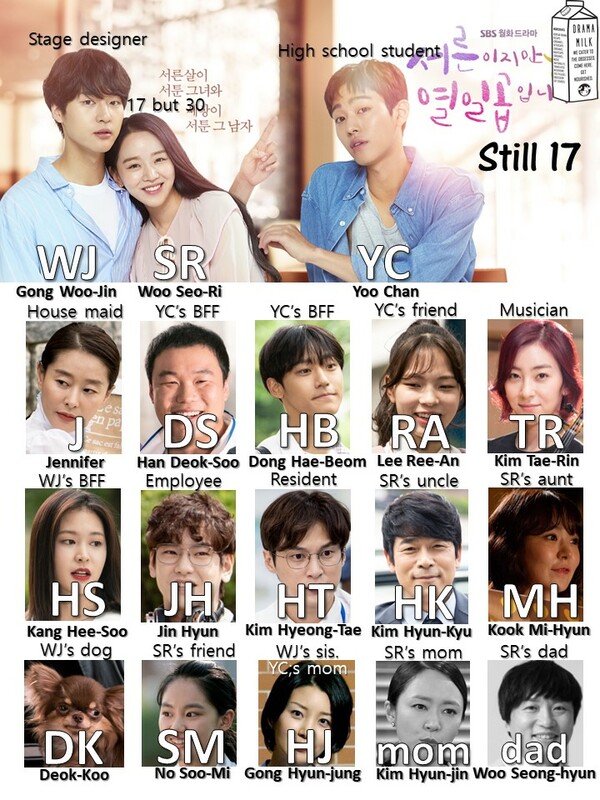 So far still enjoying Still 17. I am pulled into Woo-jin’s struggle to stay away from Sori. He has a really good reason too, considering she is the cause of his episodes where he can barely function for who knows how long. Even though he does not care what people think about him, it would still be very embarrassing and awkward if that happened at work. Let alone concerning to his colleagues. 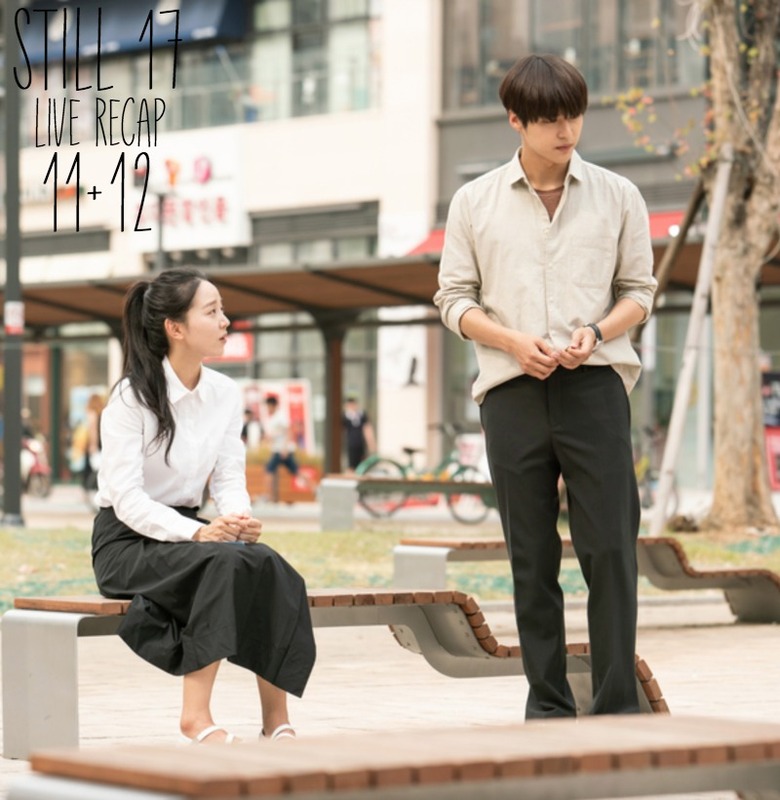 Recap Countdown: AFTER ARE YOU HUMAN TOO!…Check twitter for updates! We open with YC receiving a call from HS. She had a question for him so he drops his things to answer it. He is also very happy to answer any question about SR so he tells her that SR is staying in their house as a housemate. HS thinks WJ must be crazy, how is he letting anyone stay in the house? YC is all like, I know right. But he is happy to talk about it. he tells HS that SR got into a super great music university in Germany. Then he gets good news from HS so he tells her that he will give her HS’s phone number and she can talk to her directly. Cut to Jennifer giving the phone to SR.
Back at practice, YC lets go of his oars again. His friend DS yells at him about it, but YC just holds his chest and says that he knows why his chest is like this. SR gets interviewed by Hee-soo. HS finds out how SR and TR get along so well since they both are musicians. She asks SR if she can help out with the classical musical festival. SR is so excited to help out. WJ comes in at that moment and find out everything. Cut to him talking to HS outside about this. How can she just hire her? HS tells him that they were worried about this because it was their first time being involved in classical music. WJ thinks there are so many people to pick, why did you pick her? HS says that she meets their criteria and Rin Kim (TR) likes her. You don’t care about other people, so why do you hate her? Flashback of WJ at the psychiatrist office. He tells him that when he is close to her, his memory is revealed again, he is scared of that. He tells HS that he does not want her, he knows it makes no sense. HS tells him that if it does not make sense then just stop now. Are you really Gong Woo-jin? Why are you all up in her business? Do I need to know something else? Why is she in your house? Inside, Jh tells SR that she writes her name so big. She thanks him for the note and is actually happy that she calls him sunbae even though she is older than him. Wj and HS come back inside so SR runs to his side to say hello. She tells him that he talked good about her right? I knew that you were a good person. Meanwhile at practice, the coach calls all of them to his side and says he has something to tell them. i am – getting married next month. Everyone cheers! YC walks away with his friends as they talk about how old the coach is. Is he 30? What’s 30 minus 19? YC walks with his friends but is a bit lost in his own thoughts. he says that even though she is 17, she is still 30. he calls to his friends, old looking and stupid one, I will buy today! they all run happily to his side. At work, HS gives SR something to work on. SR is so happy to receive it. They ask where Gong is, SR checks her notes and tells them that he left at a certain time. HS thinks he couldn’t have possibly finished so soon. She runs to his desk and checks everything, surprisingly, everything is done very well. TR calls and asks if SR can come with her company people, she would like to see them at her concert if possible. But when she hangs up, she realizes that she did not ask for her name. SR gets back to work and asks all the details that TR wants for the concert. HS tells her that she can take care of everything, she does not know that much about concert music so she is relying on SR.
WJ is walking around and thinking about what the psychiatrist told him. he should not avoid the situation and should recognize that she is a different person. WJ sees himself bicycling to the spot at the bottom of the chairs and watching No Soo-mi as a child. he starts to have another attack as everything goes to black and white around him. His office calls, but he is not able to talk to the person, he drops his phone as the person on the other end talks. it is SR. WJ is able to reach down and tells her to speak. SR brightly tells him all the things that she is supposed to tell him. Also, if you left your car can we ride back together? he pauses for a moment but then tells her that she should go home first. YC blows up a lot of balloons for SR as a surprise for her. Jennifer get in on the fun in the robotic way that Jennifer does. Afterward, YC goes to his room and talks to his little chick. he tells his chick that he doesn’t like ajumma, she is 30….I like you and ajumma the same, okay? Meanwhile, WJ is in his bed thinking about that day that his life changed. he keeps thinking about telling her to not stop at that stop, but the next one. he can’t sleep and just holds his legs on the floor as he thinks about it. Downstairs, SR isn’t sleeping either, she is folding socks and trying to stay awake. But then seh hears someone outside so she checks, but no one is there. However we see that Wj is leaving extra early. SR gets ready for work and sees a gift that Jennifer left for her for getting a job. But Jennifer left a note that says not to thank her because that is cheesy. YC wakes up and asks SR why she is awake so early. SR tells her that she is going to work (it’s 5am). But YC is concerned and tells her that he has to work out in the morning, maybe he can ride his bike and take her there. But he does not have a bicycle so he has to find one. he remembers seeing one somewhere and finds it in the trash. he takes it back to the house and acts like he owns it. But the bike has Pororo on it which sends SR into a mini flashback. YC tells her that he really liked Pororo when he was little. She hops on and holds his waist as they ride off. But they go down hill which is too fast so she pulls his clothing, but she is holding his underwear on accident so she is basically giving him a huge wedgie as they go downhill. WJ is actually not at work, he had a morning meeting so he left already. They think that this is weird, he does not work that hard. But HS looks at SR and feels something. however JH says that they should congratulate SR for her job, so HS thinks up a spot for them to eat. Meanwhile, WJ measures things all day long and into the night. At the same time, HS and JH go out to have drinks with SR. She mentions that she has never drank before. They think that is weird, you are thirty. SR takes a shot of soju and immediately likes it as if she is a natural drinker. JH mentions that this is her first time right? (Because she took her shot to the head) SR says she didn’t want to waste it and has a very silly smile on as if she is almost drunk already. HS asks SR about her relationship with WJ. SR says she is living there, but she will move out soon. HS says that he is a strange guy, but he is not a bad person. SR says he is a nice person and takes care of her. HS thinks that is so weird, she has known him for 10 years and he is not known for taking care of people. HS went to school in Germany with WJ and is his only friend. She says that must be why his life is so hard. SR thinks about WJ saving her life in the middle of the street. She wants to ask WJ about it, but decides against it. YC calls WJ and who is still out in the city. he tells his nephew that he is working. His nephew and friends tell him that they have pig feet! i love you! YC asks WJ if anything happened to him? WJ tells him that nothing happened, don’t worry. He hangs up and looks at his camera. He wonders why he has this one shocking photo of SR, she looks like she was caught off guard when it was taken. he wonders why he has that image and remembers when it happened. Then he remembers that he should not link her to that accident. he thinks about SR and about Soo-mi from his past. The doctor wants him to think of them as two different people. the camera spans out as he looks at her photo. YC works out at home and calls HS. he says that she is working her new employee too much. But HS says she took good care of her and fed her a lot of food and alcohol. YC is so concerned, YOU GAVE AJUMMA ALCOHOL? Cut to a drunk ajumma looking at her violin in the violin shop. She drunkenly tells it that she will make a lot of money and come for it. She walks to the street and hears a person singing a song about being 17, she tells him that she is 17 too! But then she says no, i am not 17 – I am 30! YC hears all this and tries to run to her side, but he thinks if he notices her now then she will be embarrassed. So he slowly follows her instead. A cute song plays during this following montage. Finally SR gets to their street and stumbles as she goes up the hill. She is about to trip over a Do Not Park sign, so YC throws something at it to push it out of the way. SR happily makes it home which makes YC think that SR is pretty smart, she can find her way home even while drunk. he goes to his room and happily talks to his bird about taking care of all of the people in that house. Meanwhile, WJ gets home as well and sits outside. Jennifer surprises him when she tells him that he is late. She apologizes and tells him that she is drying pepper (followed by a lot of technical drying things). She asks him if he would like a night snack. He says he does not eat that stuff. She understands, but she keeps standing outside. He asks her if she is going inside but she says that she likes the moon and wants to have a moon shower. WJ mentions that time goes by so slowly to him, he wants it to go by faster. he wants to wake up and one month has passed. Jennifer tells him that time just runs. Time that is so difficult where the only wish is to die…someday, it will move again. that hard memory that you will never forget. One day will come where you don’t even think about it anymore. Time will pass regardless, if you only wish for time to pass, the important thing is that it sweeps by together. If you regret it then it is already late….well, I am done with my moonlight shower, so goodbye. She walks off mechanically. WJ is left thinking about all that she said. Inside, SR is still drunk. She is thirsty and drinks some water. But then she goes upstairs drunk. Dukgu follows her. SR hops in bed and gets under the covers with a sleeping WJ. Only she is at the foot of the bed. SR wakes up to a sleeping WJ. Now they are face to face and under the blankets together. VO – What, I have an ajusshi dream. What is going on? It looks so real. She reaches out to touch him. He opens his eyes. VO – Wow, he opened his eyes, this looks so real. She touches his face and then slaps it. SR – This is a dream. WJ – I don’t think so. SR – No….if it is not a dream then you shuldn’t be here. WJ – This is my room. SR – This is my room. WJ – it used to be…13 years ago. SR pulls the covers off and looks around. She quickly hops up while yelling. AH, THE SOJU WAS SO TASTY I DRANK TOO MUCH I AM SORRY. YC comes to the door to see if Mr. Gong is awake. SR quickly runs and hides in eh closet. YC gets soemthing out of the closet, but wj tells him that it is in the dry cleaners. YC leaves with cologne instead. Once YC leaves, WJ goes to the closet and asks her why she is hiding. She asks him why the plunger is in the closet. He asks why it shouldn’t be there. She says it is better to have it outside to open the window. But then she runs out and does not see WJ’s Pororo case where his picture is. he thinks that he tries to cut her off, but he cant. Somehow he cannot get her out of his brain. SR walks downstairs wondering why he put the plunger in the closet. YC talks to her about her job, isn’t she going? But SR says that they told her not to come too early. YC is all like, what is Ms. Kang doing! She should not make an employee discouraged. SR leaves for work and the woman with yellow shoes follows. JH asks SR about classical music that TR wanted them to listen too. She says she will listen too it. he runs and grabs something for her to use to listen to and borrows WJ’s. But it looks like it is not working, it does not make any sound. SR tells JH this. Jh thinks it might be broken so he runs to get his ear pieces. SR thinks back to the head phones being unplugged. WJ comes in at that moment and tells him that his earphones are unplugged, why do you use them? WJ just calmly tells her that they don’t know each other that well for him to explain himself to her. He does not think they will see each other in the future either. He walks by her. SR watches him leave and then goes outside to think about it. She thinks about all the nice things he did for her but then thinks about him telling her that they are not close and will not be close so they don’t need to know each other well. SR goes back inside and runs into WJ. She tells him that she thought he left and did not come back. She tries to leave the break room, but accidentally locks them both inside. She says…um….I heard this door was broken…..Umm….I am sorry…. WJ does not say anything and just lets his coffee drip slowly. Time passes quietly. But then SR accidentally hits the coffee grinder. Wj stops it and goes back to his drip coffee. SR hears someone in the other room and calls for them to let them out. JH comes in and sees the two of them together. he tells SR that she looks older all of a sudden. She goes past him to her desk. WJ walks past and tells Jh that he should fix the door. At the desk, HS tells WJ that she has to go somewhere else with JH so WJ needs to take SR to meet TR. TR really wants to see SR. But WJ does not want to take her so HS gives SR a credit card and tells her to take a taxi. SR runs outside and asks WJ if she did something wrong. It seems like she did so just tell me and I can change or apologize or try to understand each other or something. But WJ says he has nothing to tell her. SR tells him that she thought they were good friends. You are letting me stay and eat at your place and look for me Woo So Ri! i am thankful for everything. Even if I don’t find my uncle and have to leave, I want to repay you for a long long long time. I want tosee you. i want to have that relationship where we see each other for a long time. i am so thankful to you. WJ gets in the car while SR tells him that she likes him and has an attachment to him! HS is working with JH when she gets a call. It seems like there is trouble on one of their sets. There was a small electrical fire so they need to fix their item. HS calls SR to find WJ. SR remembers where he was going and runs to that location to grab him. She sees him int he crowd and tries to get to him. But he dissapears among everyone. However, she hears someone say on the announcer for a little boy to come to the front. SR runs to the top and asks the announcer to find Gong Woo-jin who is 3 years old……but then SR tells him that he is 30 years old. But she pushes him out of the way and tells him that she is looking for him. if you hear me then come to the front. If you don’t hear me it is becuase you are using your ruler! Everyone notices the guy witht he ruler and headphones. WJ notices people pointing at him and hears the announcement. SR keeps telling the mic that it is an emergency but stops when WJ shows up so they have to run off. SR and WJ hop into the car and take off to fix the set. they get to the set adn fix the floor that was damaged. But it is slippery so JH falls. But then SR falls. WJ grabs SR from falling and they have a moment. But then they wonder why the floor is so slippery all of a sudden. WJ thinks it is the same color, but a different material. SR hears music and runs to find them. She gets to a music hall and asks them for pine tree extract. o they have any! SR gets the pine tree extract/wax and brings it back to everyone to put on the floor, they all get busy doing that. it must have worked because everyone looks happy afterwards. JH wonders how she thought about getting the pine resin. Then they see that her hands are very dirty and kind of ijnured, but she says it is okay. they go to watch the performance, but the person at the door says that they only have 3 seats together. SR says she can sit far away, but WJ tells them that he wants to. They start the performance. SR watches TR play and is immediately taken back to her emotions and childhood when she first started the violin and when her mother gave her violin to her. She will realize her dream with her mothers old violin. She continues to watch Kim Tae-rin play as she thinks about this and also imagines herself in her place. She says she will be a world famous violinist and wear a nice dress during her performance, so look forward to it. SR starts crying during the performance, but they are silent tears. WJ is sitting behind her and sees her crying as seh watches it. VO – I was about to go to Berlin….she couldnt’ go to school because of something. After the performance, theya ll tell TR that the performance was great. They had an accident and could not perform a bouquet. TR tells her that it is okay, then she asks if this girl is SR? She is so happy to meet you and have someone she can talk to. SR is abotu to shake her hands, but SR notices that her own hands are dirty and doe snot want to dirty the performers hands. TR asks her name. SR tells her that her name is Woo So-ri. TR immediately remembers that name and is sent into a flashback. The teachers said that Sori was so noticable so he picked her. TR was jealous. In her room, TR wonders how that Woo Sori is here now. Meanwhile, SR drives home with WJ. She looks at her little cuts on her hands. he thinks about how she practices with her hand to relax her hand. YC is concerned about SR’s hands. He asks WJ how he can make her hands like that, don’t you know that she is a violinist? YC runs to find medicine for her. it is raining and he is frantic as he searches for any store that is open. he finally gets back home with medicine, But Jennifer is there to take care of it all. YC goes upstairs and tells the chicken that her and ajumma are different. WJ goes to his room and tries to work, but he can’t focus and decides to lay in bed instead. SR is downstairs trying not to cry as she peels onions in the living room. She is about to wipe her tears when WJ grabs her arms suddenly. He tells her not to wipe her eyes with her hand (because of the onions). But she lets go and tells him that she is not crying, it’s the onions. But he turns her face towards him slowly. VO – The time together with her had my scariest and most feared moments… and my most comfortable and happy moments as well. They were all with her. So far I have really enjoyed every episode of this show. I love how it really was partly Woo-jin’s fault that Sori was in that accident. She would have been off the bus one stop before, if it was not for him. That is something to seriously come to grips with. The writer isn’t making it an accidental mistake either. He told her to stay on the bus and she listened to him. I can see that affecting anyone for years and years and years. I’m not even sure if finding out that she is alive with fully heal him because she still lost 13 years of her life. The only consolement he has is that he did not cause the accident, he is not actually at fault, it was just an unfortunate situation that he was pulled into. He has managed to continue on with life and be successful, which I am sure was a very uphill battle. Leaving Korea for Germany probably helped. Though he is probably the 30 year old equivalent to 40 year Old Virgin (if you have seen that movie). I don’t think he has ever had a girlfriend or even a close friend besides his nephew and work colleague. The only thing he likes in life is measuring and creating things. His measuring stick is even like a crutch that he has pulled out lately when he feels overwhelmed, which makes me think that he got into that habit right after the accident. Hmm, I wonder if we will see a flashback about that? I love Sori. She is so bright and wonderful. I love what Sashaa said about how WJ should just let Sori’s warmth fill the room. I was a bit touched at the end of this episode where Sori imagined what her life would be like if she had the opportunity to continue with the violin. I can only imagine the torment that WJ will feel once he finds out that she did not die (ie he didn’t kill her), she actually went into a coma to wake up years later to a very changed Seoul (which reminds me of Forever Young) and has yet to find out what befell her loved ones. I imagine that will torment him to no end so you know it will probably happen during episode 11 or 12 (22 or 24). And yet surprisingly this show is so lighthearted and wonderful! I love shows like this that tackle hefty topics, but still make them fun and delightful to watch. These are my absolute favorite shows. In a side note, I am really looking forward to watching Hunt for the Wilder People which does the exact same thing. YC – I will win this competition and in the best moment I will confess to ajumma. WJ – You don’t distinguish work and personal life again? JH – You are saying that because you did not see it. SR – Were is bar 7? JH – [Someone was] hitting on hubae noona! WJ – Is it going to snow? SR – What? Snow in summer? HS – Do you want to talk to our SR? TR – No…I am a little busy. I am so random with the images. I usually just pick something I like from whatever is available on their website. All up now! I had an 11 oclock phone call appointment so we had to stop as soon as he called (he was super prompt, which I love). But we tried to hold on until that last moment 🙂 . Awww YC is so cute. I know they’re not the otp but WJ needs to step up to make room in my heart. YC leads by a huge margin. I’m already feeling bad for YC, we already know YC will be heart broken… As much as I like the idea of WJ and SR liking each other before knowing the truth but it’s driving me crazy at the same time.. Korean Drama… keeps me a wake at nights… Thanks for the recap of course and are you going to finish it? I am so grateful for this!!! Especially when you still try to attempt to complete what you can instead of making us all wait till you can get to all of it. Thank you! Thank You! Thank You! Thanks for trying to get to all the dramas! Pleas accept our thanks. And am really liking this show. These 2 really seem to have a connection. A understanding. It was hard to watch WJ keep his distance – it made both miserable. And that last scene was so calming and so tender. If only he let his warmth fill the room so many people would be happy. I like how this show avoids tropes. When YC came back with medicine most dramas would have the other lead applying medicine or given her the medicine. But in this case it’s Jrnnifer. More than about love I think it’s this family vibes that I like. She needs everyone. A family. They all need each other. Even Jennifer needs a chat once in awhile. Like someone said earlier we would love to hear your thoughts too. After recap please do write a few lines on what you thought. yes, I need to come back to leave comments at the end of the day! I will try to do that from now on! Added some thoughts to the end! I didn’t realize I had so much to say 🙂 . I agree, knowing she didn’t die but lost 13 years of her life is another problem he has to face. But this time he can stand by her and help her regain her life. I think that’s why her growth is so crucial for everyone’s happiness. Am sure she will flourish. Hefty topic + delightful watch = exactly what I like too! I like Gangnam too for the same reason. Yes, Gangnam is hitting all my spots. Both shows make me so happy.